For Tamarac Precast Concrete Scuppers that are reasonably priced call our friendly staff at Atlantic Coast Precast today. We started our business in 1965 , and have since then gained a stellar reputation that we work hard to maintain. Concrete scuppers are very important in maintaining rain gutter systems, and in helping to channel water away from your architectural structure. Water damage can be very expensive to repair, so it is very important to protect your building before the damage can take place. 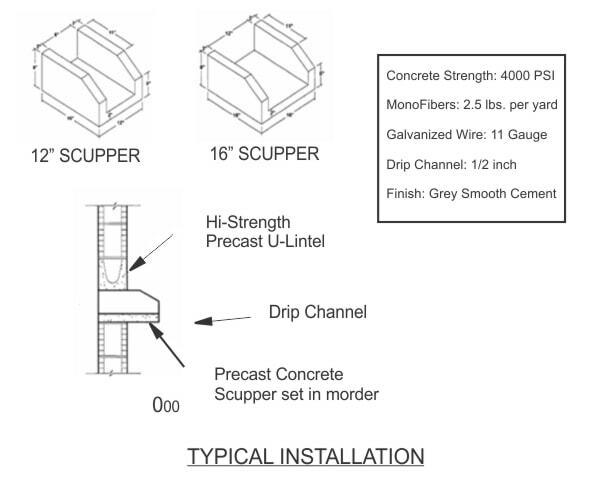 Concrete scuppers are also called downspout splash guards, which are used to channel water away from a building. To hear more about our concrete scuppers give us a call today! Tamarac Precast Concrete Scuppers from Atlantic Coast Precast are vital in managing rainwater, and will help to prevent water damage. Our customers can choose from a selection of sizes and shapes that are most suitable for their projects. Contractors, architects, engineers, designers, and other industry professionals love our splash guards and their many versatile ways of using them. We aim for 100% customer satisfaction, and will work hard to exceed your expectations. We will make you our top priority when you hire us! We guarantee your complete satisfaction! Tamarac our Precast Concrete Scuppers are designed from durable precast materials that can be customized into any design that you need for your project. Our splash guards are ideal for any commercial or industrial project, so do not hesitate to contact us. Designed to last a long time, and withstand a high volume of water our splash guards will not disappoint you! Call our team of experts today for more information. We will be happy to answer your questions and give you a free quote! We look forward to hearing from you soon!